Five litterateurs were awarded 'Uro Child Literature Award 2006 and 2007' yesterday for their outstanding contribution to child literature. 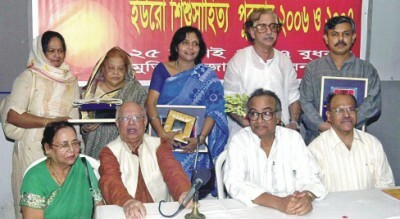 Late poet Shamsur Rahman, writer and academician Muhammad Zafar Iqbal and writer and columnist Anisul Huq received the award for 2006 while novelist Rabeya Khatun and Ekhlasuddin Ahmed received the award for 2007. The award carries a crest, a certificate and a cheque for Tk 20,000. The award giving ceremony organised by Bangladesh Shishu Sahitya Sangstha was held at the Liberation War Museum in the city. Shamsur Rahman was awarded for his book titled 'Hirar Pakhir Gan', Zafar Iqbal for his book, 'Doshshi Kojon', and Anisul Huq for his book, 'Boka Goyenda', Rabeya Khatun for her book, 'Chhotoder Upuhar', and Ekhlasuddin Ahmed for his book, 'Onno Ek Apu'. Dramatist Mamtazuddin Ahmed, language movement veteran Mahbub Ul Alam Chowdhury and Khairul Anam, director, Sales and Marketing of Globe Soft Drinks Ltd, gave away the awards to the recipients. The wife of Shamsur Rahman and the wife of Zafar Iqbal received the awards on behalf of their husbands. Speaking as the chief guest, Mahbub Ul Alam Chowdhury said the quality of education has deteriorated to such an extent that a child cannot understand literature properly. "Stern action should be taken against the 'corrupt people' who destroyed the education system by appointing teachers in exchange of money over the years," he said and urged all to work hard to put the education system back on right track. Amirul Islam, general secretary of Bangladesh Shishu Sahitya Sangstha, said good child literature can help children grow up mentally. Poet Asad Chowdhury and litterateur Ali Imam also spoke.